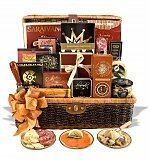 A gourmet fruit gift basket filled with life's wonders. Fancy fruits and Godiva chocolate. 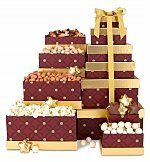 When you want to give the very best, a tantalizing treat combination that everyone loves. 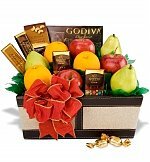 Fresh fruit that is naturally sweet combined with decadent chocolate that's rich and delicious. 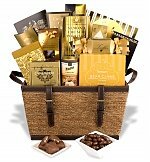 The recipient will be treated to ripe D'Anjou Pears, Fuji Apples, and California Navel Oranges along with Godiva 85% Dark Chocolate, Godiva Chocoiste with Caramel, Godiva Chocoiste with Almonds, Godiva Milk Chocolate Gems, Godiva Dark Chocolate Gems, and Godiva Chocolate Covered Cashews. Measures 13" x 10" x 10" and weighs approx. 9 lbs.